A glutamate imaging technique called GluCEST (glutamate chemical exchange saturation transfer) used with a high-field 7T magnetic resonance system shows the potential to identify subtle lesions in the brains of drug-resistant epilepsy patients, according to a research team from the University of Pennsylvania in Philadelphia. While still in the early clinical research phase, this new neuroimaging technique may lead to improved clinical outcomes for the treatment of temporal lobe epilepsy. An estimated 65 million individuals worldwide have epilepsy, and approximately 22 million experience seizures that cannot be controlled by medication. Drug-resistant epilepsy patients have surgical removal of lesions, and they undergo structural and functional imaging for surgical planning. However, for a large percentage of these patients, conventional MRI, FDG-PET, SPECT, and magnetoencephalography – even used in conjunction with scalp electroencephalography (EEG) – may not adequately localize the seizure focus. Kathryn Davis, MD,, assistant professor of neurology at the Perelman School of Medicine, and co-authors of a study published in the October issue of Science Translational Medicine, hypothesized that the GluCEST method would be able to localize the hemisphere containing the epileptic network by visualizing increased glutamate in the hippocampus of patients with nonlesional temporal lobe epilepsy. They conducted a study of four nonlesional drug-resistant epilepsy patients being treated at the Penn Epilepsy Center and eleven healthy patients as controls. The imaging technique relies on unique chemical properties of glutamate that permit water molecules surrounding the chemical to be visualized at very high resolution. An increased signal from the surrounding water molecules indicates increased levels of glutamate. The researchers reported that concentrates of glutamate measured by GluCEST were both qualitatively and quantitatively higher in the ipsilateral hippocampus than in the contralateral hippocampus in all four epilepsy patients. They confirmed these findings by electroencephalography, which identifies the side of the brain emitting irregular waves as a seizure is occurring. 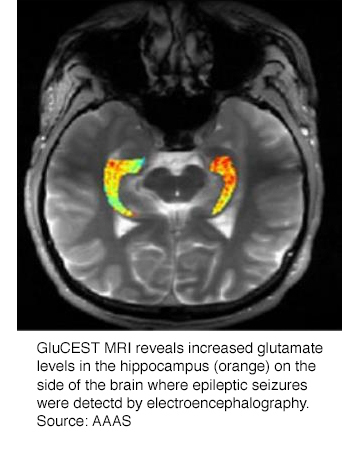 In all of the healthy individuals, the GluCEST signal for glutamate was equivalent in either side of the hippocampus. The researchers are optimistic that the GluCEST imaging technique offers the possibility for expanded epilepsy treatments that could include surgery or laser ablation therapy. They stated that one of the reasons that they formally published the findings of such a small patient study is that they hope sharing their results might expedite validation of the technique. This research program is funded by the National Institute of Biomedical Imaging and Bioengineering (NIBIB). Richard Conroy, PhD, director of the NIBIB Division of Applied Science and Technology said in a press release that the GluCEST imaging technique’s ability to image distinct patterns and changes in glutamate levels in brain structure could be indicative of identifying neurological disorders. Davis KA, Nanga RPR, Das S, et al. Glutamate imaging (GluCEST) lateralizes epileptic foci in nonlesional temporal lobe epilepsy. 2015 Sci Transl Med. 7;309:309ra161. New MRI technique identifies previously undetected epileptic seizure sites. Appl Radiol.